Dr. Will Caster (Johnny Depp) and his wife Evelyn (Rebecca Hall) are two of the nation's top research and developers of a new, advanced type of artificial intelligence. Along with their colleague Max (Paul Bettany), they have strong ideas about how this A.I. can work for the betterment of mankind. When Will is shot with a radiation-laced bullet by a radical member of R.I.F.T. (Revolutionary Independence From Technology) in a coordinated attack on A.I. labs across the country, he does not have long to live. In an effort to keep his consciousness alive after his body dies, Evelyn and Max upload his brain into P.I.N.N., their artificially intelligent supercomputer. The process seems successful, but many are unsure if the computer is actually Will, or if it's just an artificially intelligent computer pretending to be Will. Make no bones about it, folks: this movie is pretty much just a sci-fi romance with a fancy-schmancy computer and medical terms thrown around like its nobody's business. When the box office numbers came out this weekend, newspapers and blogs alike proclaimed "Transcendence" was Johnny Depp's 4th straight flop in theaters and that he hadn't made a box office smash since the last installment of the (overdrawn) "Pirates of the Caribbean" series. To this, I thought: poor, poor Johnny Depp, sitting on his millions (if not billions) of dollars with his numerous houses and series of cars and fame and riches and jewels, he made another flop. Boo-hoo. Well, we must admit, this movie was not his strongest, but it's really not as bad as people are making it out to be. Sure, it takes itself too seriously and drags through many parts of the film, but the idea is captivating and makes for a semi-decent ride. Let's put it to you this way: we wouldn't be disappointed if we had actually spend $6.00 on this movie, but I'd be pissed if we had spent more than that. Rebecca Hall is good in this film. The majority of the drama and emotion comes from her character. She does a great job showing what one woman would do to save the man she loves. The cast of supporting actors including Paul Bettany, Morgan Freeman, and Cillian Murphy are all good in this film, too, and it's nice to see the "Batman" tie-in with Morgan and Murphy (this movie was directed by longtime Christopher Nolan cinematographer Wally Pfister). I think my biggest problem with this movie is, in fact, Mr. Millions himself, Johnny Depp. I just don't buy it, I don't buy him in this role. BigJ didn't like Kate Mara or her character as a RIFT terrorist. He doesn't know if the movie was trying to portray her as someone we should feel sympathetic towards, but all in all, she is just a terrorist. She kills for her ideals and perpetuates fear...there is nothing sympathetic about that. Other than that, this movie feels really, really complicated but still manages to not go very far. It's fear-mongering and technological acceptance all in one, and we're not quite sure which prevailed in the end. Sure, there's a clear ending point, but the entire movie feels overworked, over-thought, and yet still remains extremely rigid. 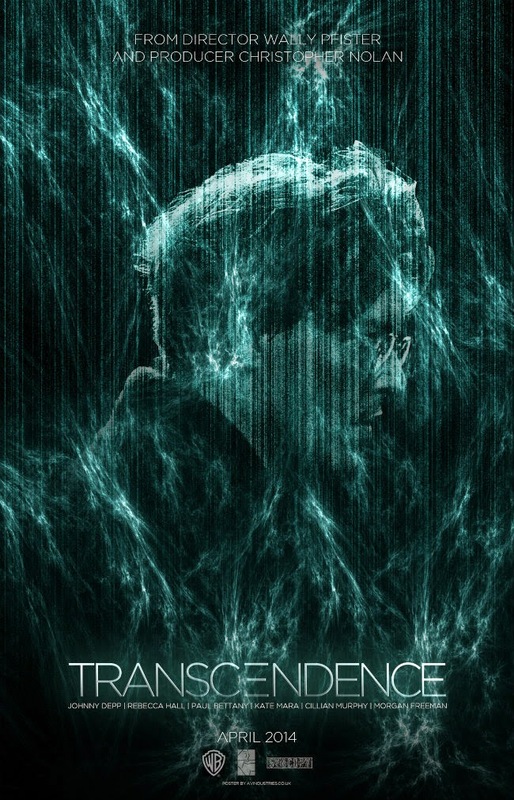 At first, I got a "Her"-esque vibe from Depp's character of Will Caster as his consciousness is uploaded into a supercomputer, but that thought quickly faded away. To me, this computer-person-mind hybrid is not capable of having even the most minute feeling, but BigJ disagrees. Perhaps it is Depp's way of acting the part, but I just didn't feel connected to him as a character who would, in turn, do anything he could to give the woman he loves what she wanted most in life. Visually, the CGI is pretty good, but at some point, it all becomes a series of squiggles. Obviously, since it's directed by a cinematographer, it is shot well. The end of the film has this overall message that makes us think that man's fear of the unknown and of advancement in general will eventually end up leading us back to the Dark Ages. Either that, or it's your basic "God" metaphor: have faith that this "higher power" will act with the best intent for humanity, even if we don't always understand its actions. I'd like to think the destruction of all of Internet-kind could be brought down by something more powerful than a roll of copper wire I could buy at Home Depot. Alright, I'm making a leap, but still...the inclusion of this seems rudimentary, at best.